Amistad Pr. Hardcover. GOOD. Spine creases, wear to binding and pages from reading. May contain limited notes, underlining or highlighting that does affect the text. Possible ex library copy, thatâll have the markings and stickers associated from the library. Accessories such as CD, codes, toys, may not be included. Anthony Appiah; Gates, Henry Louis, Jr.
HarperCollins Publishers, 1993. Hardcover. Very Good. Disclaimer:A copy that has been read, but remains in excellent condition. Pages are intact and are not marred by notes or highlighting, but may contain a neat previous owner name. The spine remains undamaged. At ThriftBooks, our motto is: Read More, Spend Less.Dust jacket quality is not guaranteed. Amistad Pr. Used - Good. Ships from Reno, NV. Former Library book. Shows some signs of wear, and may have some markings on the inside. 100% Money Back Guarantee. Shipped to over one million happy customers. Your purchase benefits world literacy! Amistad Pr. Used - Very Good. Ships from Reno, NV. Former Library book. Great condition for a used book! Minimal wear. 100% Money Back Guarantee. Shipped to over one million happy customers. Your purchase benefits world literacy! Amistad Pr. Used - Good. Former Library book. Shows some signs of wear, and may have some markings on the inside. Amistad Pr. Used - Very Good. Former Library book. Great condition for a used book! Minimal wear. Amistad Pr, 1993-02. Hardcover. Good. 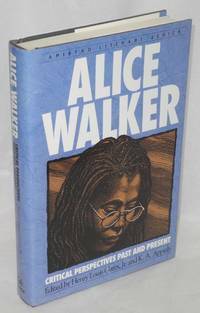 Walker, Alice, edited by Henry Louis Gates, Jr. & K. A. Appiah, Marge Piercy, Greil Marcus, Ursula K. Le Guin, J. M. Coetzee et al. New York: Amistad, 1993. Hardcover. xiii, 368p., preface, reviews, essays, interviews, essayists, chronology, bibliography, index, notes, fine first edition in cloth boards and unclipped dj. Amistad Literary Series. Amistad Pr. Hardcover. 1567430139 1st Edition Book is in like new condition. Customer service is our #1 priority. We sell great books at great prices with super fast shipping. . Fine. Amistad Pr. Hardcover. 1567430139 New Condition. . New. Amistad Pr, 1993-02-01. Hardcover. Used:Good.